The Tuscan Coast is a relatively new high-quality Italian wine production area that didn't exist as such 35 years ago. Many highly collectible red wines are made there today, and names like Sassicaia, Ornellaia and Tua Rita have become famous the world over. However, most wine lovers probably don’t realize that as recently as the early 1980s, only two such wines were produced, Sassicaia and Grattamacco. In fact, most people assume that Ornellaia followed immediately in the footsteps of Sassicaia, but that’s not so. Fifteen years separated the birth of those two wines—and much more if one considers that Sassicaia’s ancestor, a wine made for the Incisa della Rocchetta family’s private consumption, was already being bottled in the 1940s. But the Tuscan Coast has been totally transformed in recent times, and today many noteworthy white wines and sweet wines are also being made by a host of quality estates that have sprung up over the last decade. The Tuscan Coast, also known as the Maremma, is a large patch of land that comprises the portion of Tuscany that hugs the Tyrrhenian Sea as well as the beautiful islands of Elba, Giglio, Capraia and Gorgona. On the mainland, the viticultural and wine production area identified as “Tuscan Coast” runs roughly from just north of Livorno (Leghorn) down to south of Grosseto (which is about an hour’s drive by car due north from Rome). In fact, the Tuscan Coast may be divided into a northern part (where the town of Bolgheri is located) known as Maremma Livornese or Alta Maremma (“high Maremma”) and a southern part that is better known as Maremma Grossetana. Although historically many in Italy refer to this southern portion of the Tuscan Coast as the Maremma proper, in fact the whole of the Maremma runs from Lazio, just north of Rome, right into Liguria, well above the northern boundary of Tuscany. The Tuscan Coast moniker is also applied to wines made in the Tuscan inland areas of Lucca and Pisa, not far removed from the coastline, whose wines greatly resemble, in both grape varieties and styles, those of the Tuscan coastal areas. The Tuscan Coast’s range of wines. The Tuscan Coast is the home of Italy’s best red wines made from international grapes such as cabernet sauvignon, cabernet franc and merlot. Although there are certainly other noteworthy red wines made with these cultivars in other parts of Italy, the truth is that other parts of the country are just too cold (Trentino Alto Adige) or rainy (Friuli Venezia Giulia) for cabernet sauvignon to ripen fully in most years; by contrast, others are too hot for merlot (Sicily). But a critical mass of world-class Bordeaux blends can be found in Bolgheri especially. For the most part, these wines also have a real “Tuscan feel” to them, with lusher fruit, stronger aromatic herb notes, riper tannins, and higher pHs than most wines made in Bordeaux. Clearly, both cabernet sauvignon and merlot do extremely well in the Tuscan Coast, with some of Italy’s most expensive, collectible and sought-after wines produced both in the north near Bolgheri (Sassicaia, Ornellaia, Masseto, Messorio, and others) and around Suvereto near Grosseto in the south (Redigaffi, Giusto di Notri). That said, there’s little doubt that the single most exciting development in Italy (and not just in the Tuscan Coast) of the last 15 years (apart from the rocket-like explosion of Etna’s nerello mascalese wines) has been the realization of just how mesmerizingly good cabernet franc wines can be here. Many cab franc wines from the Tuscan Coast are monovarietal, and therefore I do not believe it’s a stretch to consider this hallowed piece of land as the world’s best for cabernet franc. The best of these highly aromatic, floral wines exude a fleshy, suave richness with lovely balancing acidity and are rarely marred by the overly pungent floral or bell pepper notes more common of cooler microclimates such as those of the Loire. After all, it cannot be a coincidence that the best wines I sample from barrel during my winery visits are almost always their lots of cabernet franc, even those wineries where the cabernet franc will later be assembled into the estate blend. Syrah also grows on the Tuscan Coast, and is almost always used in blends: producers believe that in this area it can produce a wine that is more refined than cabernet sauvignon, but oak regimens need to be studied carefully. Using only small oak barrels, or barriques, is probably not a good idea, and in fact most wineries have switched over to tonneaux (barrels with a capacity of 500 to 600 liters, as opposed to 225) for aging their syrah wines. In a warm microclimate, care must also be taken to avoid overripeness, because otherwise the syrah becomes too jammy and too spicy. Not surprisingly, sangiovese is also a player in the Tuscan Coast, but the region’s fertile soils and generally hot summers and short growing seasons are far from ideal for the variety. Sangiovese does best in the southern reaches of the area: Morellino di Scansano is an inexpensive and extremely popular wine (think of a softer, fleshier entry-level Chianti). 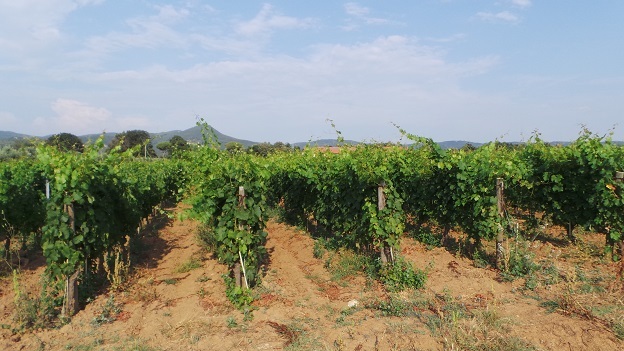 In nearby Monteregio di Massa Marittima, the climate is hotter, and so harvests occur even earlier, as early as late August. Last but not least, the Tuscan Coast is home to lovely white wines made with ansonica and vermentino, or blends of the two varieties. Quite a bit of viognier and sauvignon blanc are also grown in the area, but these varieties, even if they make perfectly acceptable wines for everyday drinking, have not yet produced any truly outstanding bottles. In particular, viognier’s rising popularity here is hard to explain: star winemaker Luca D’Attoma thinks it may be more a media issue than a matter of actual high-quality wines, but he admits that the variety is a good partner for vermentino, which is softened by the addition of viognier. Just remember that because the Tuscan Coast is a relatively young viticultural region, there is still a noteworthy gap in wine quality between the best estates and the rest, although that gap has been closing in recent years. Your best bet for wine-drinking bliss is to commit to memory the names of the top estates. Recent vintages. As a general rule, the northern Tuscan Coast is characterized by cooler and more even temperatures than the southern part, where it can get very hot. I have written before in the International Wine Cellar that there can be as much as a 4°C difference in average mean temperature between the southern vineyards of Suvereto and the northern, seashore-hugging ones of Bolgheri. Also, summers in these southern vineyards are usually much warmer than those of Chianti or Montalcino, and the wines are softer and richer than Chianti Classico or Brunello. According to D’Attoma, 2013 is a potentially stellar year due to a long growth cycle, although wet weather that occurred throughout the growth cycle and especially in the fall meant that botrytis was a potential problem. He believes that the wines are similar to the 2010s, but with even more stuffing. “It will prove to a very good to outstanding year for the white wines as well, but of course careful grape selection and sorting will be key,” he told me. It is an especially great vintage in the area of Suvereto. Winemaker Valentino Ciarla believes that the atypically large amounts of rainfall in 2013 meant that those estates strongest on viticultural work did best. “Those who just relied on lab analysis didn’t do well, as one really needed to go into the vineyards over and over again to make sure there were no potential problems festering,” he told me in July. “For instance, I had to push estates to harvest sooner or everything would have rotted on the vines.” In his view, 2013 will prove to be a vintage of wonderfully refined sangiovese wines and very aromatic vermentinos. By contrast, 2012 and 2011 were very hot vintages, but with noteworthy differences between them. The 2012 vintage was a very hot one not unlike 2008, but unlike in 2003 (when the heat started in early May and never let up), the hot weather did not become established until July and August, and otherwise the season hopped along smoothly. In 2011, the heat arrived early and continued through the vine’s growth cycle. Overall, I encourage readers to give the 2011s their fullest attention, to pick carefully in 2012, and to look forward to lighter-styled, fresher-than-usual reds and lively whites in 2013.